Hakuyuko: Why is everything so quiet now? Shinkohyo: Because all is well with the world. The final volume of Soul Hunter begins with uncertainty about the future. Dakki is destroyed, but along with her, the Yin Dynasty has been laid to waste. The Emperor, the two princes of Yin, and Bunchu are all dead. However, peace seems to be maintainable, and perhaps there is a future after all. 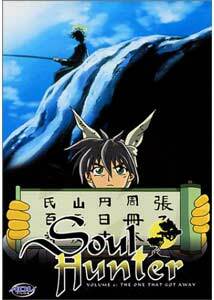 Taikoubou and his friends must return to the Immortal World now that Project Soul Hunt is over and done with. Still, one lingering question hangs in Taikoubou's mind: Why was Dakki seemingly receiving power from Heaven? It didn't make sense, but his suspicions grow into convictions when Shinkohyo (the mysterious observer who has followed the story from the beginning) reveals to him that Dakki's soul is not going to the Pillar of Souls, where all demon souls go, but rather it is returning to Mount Kunlun itself, the core of Heaven. Why? Could it be that the very same masters of the Immortal World that charged Taikoubou with his mission were, in fact, controlling the mission from the start? Taikoubou, Sibuxiang, Raishinshi, and the rest of the surviving Immortal soldiers decide to band together and return to Heaven, and face the true villainy behind Dakki's presence on Earth. They want answers to complex questions, but before they can get them, they discover that Mount Kunlun is being defended by powerful giant robots, the very power of the Immortals itself, and also guarded by the betrayal of an old friend. What is Mount Kunlun hiding? Tragic, and at times a bit haunting, this final 5-episode story arc of the series not only closes the whole series, but also examines questions of where Taikoubou came from and where he might be going. The entire series up until now is shown in a new light when we understand the mystery of what's been going behind the scenes as well as the origins of many of the characters. A few other little questions are answered as well, and it all leads to a killer set of final episodes that will absolutely rock the Soul Hunter fan. Although some might be bothered by the way these final episodes switch between present day and flashbacks into Taikoubou's past (the next-to-last episode is, in fact, one long flashback), but I found it an effective way of adding an emotional context to these final episodes. We see how everything ties together, and we also understand some motivations better. In the end, I felt wholly satisfied with the conclusion of the series and wasn't disappointed at all. In fact, I was most surprised by the direction the show took in pulling this surprise plot out of nowhere. Despite the often humorous and slapstick nature of the show, especially in the earlier episodes, this final push adds much more depth and meaning to the show, something from which any series can benefit. Overall, Soul Hunter is a series I highly enjoyed and I think ranks among the better anime out there. Its division between fantasy and political conflict is well balanced, and it never sidetracks from the core idea. I suppose, technically, there is potential for a future series with the same characters (Soul Hunter probably continued on in Japan's Shonen Jump comics), but to be honest, I think it should be left as is. It ends on a nice, philosophical note leaving a rather clever flavor behind and I'd hate to see that spoiled by a 'quickie' continuation. Image Transfer Review: The final disc is just as vibrant and crisp as the rest. Although some of the computer enhanced footage has a little bit of 'rainbow' effect, nothing really takes away from the excellent transfer. The cel work has some grain and obvious visual anomalies (like visible brush strokes) but it's all part of the medium. Audio Transfer Review: The soundtrack is fairly active and beefy, given the limited nature of the track. There are no surround effects, but the frontal imaging and directionality certain adds a lot to these final episodes, and the musical soundtrack is well presented. Extras Review: The typical extras are included, all of which designed to help viewers understand the source of the characters and the meanings of the foreign terms. It's all presented well, as usual, and makes it a little easier to follow all the goings on. There's also profiles of the English voice talent, though admittedly, Japanese voice actor profiles would be nice since this is the last disc in the series. It also bears mentioning (and this goes for all of the Soul Hunter discs) that the artistic presentation, primarily on the menus is extremely well done. The real soul of the disc (no pun intended) is showcased in the clever themes used to design the covers, menus, and inserts. Soul Hunter is well worth viewing, as a series with lots of humor, complexity, and a good knowledge of how to balance its own issues. It takes a creative approach in making these 5 final episodes the real finale, as opposed to letting things end only the with completion of Project Soul Hunt. Easily one of the better, more detailed anime shows out there, and certainly recommendable to a wide variety of animation buff.